Cascade is a web-based strategy system that enables a company’s top management to communicate and implement their plans effectively by engaging all parties and monitor their progress and more. 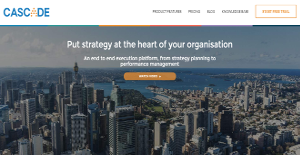 With Cascade Execute Strategy, average employees are engaged by providing them with the bigger picture of the company’s strategy and how they play a part in the plans. By combining strategy planning and performance management into a single, unified solution, companies get execution software that handles all matters related to project planning and realization from end to end. Cascade Execute Strategy software helps enterprises and organizations turn their workforce into an aligned, cohesive, empowered and engaged unit. With Cascade Execute Strategy, you don’t just come up with excellent plans for your company. The software allows you to be on top of everything in every step of the way – from conceptualization to realization. This strategy planning software enables users to build plans that are aligned to your corporate goals, vision, values, and focus areas. You can tailor your framework based on your preferences and company goals so you can easily address your requirements with more precision. The software comes with an intuitive build wizard that guides you on all your steps and helps you create a feasible, logical plan that is founded on your company’s vision, values, focus areas and goals. With Cascade Execute Strategy, it is very easy to customize all aspects of your plans. There is not much hassle involved in modifying terminologies. In most cases, the problem with having a sound and feasible strategy is how to communicate them to all levels of your organization and how you convey to average employees their roles and functions. Effortlessly share plans and reports by exporting them as PDFs or present them in video format. Top management can assign specific goals to specific departments and individuals to ensure accountability. Cascade Execute Strategy makes it easy for you to visualize your strategy by implementing interactive views like Cascade Trees and Gantt charts. You can load the whole chart of your organizations and see which goals are assigned to whom and monitor their progress effortlessly. Identifying issues and determining areas of concerns become simpler as you can view data and gain insights from information you can easily access and analyze. If you are interested in Cascade it might also be beneficial to check out other subcategories of Best Business Process Management Software gathered in our database of SaaS software reviews. There are popular and widely used systems in each software group. But are they automatically the best fit for your organization’s unique needs? A trendy software product may have thousands of users, but does it provide what you require? For this reason, do not blindly shell out for popular systems. Read at least a few Cascade reviews and think about the factors that you desire in the software such as the price, main features, available integrations etc. Then, choose a few apps that fit your requirements. Try out the free trials of these platforms, read online comments, get clarifications from the maker, and do your homework systematically. This profound research is certain to aid you select the most excellent software application for your firm’s specific needs. How Much Does Cascade Cost? We realize that when you make a decision to buy Business Process Management Software it’s important not only to see how experts evaluate it in their reviews, but also to find out if the real people and companies that buy it are actually satisfied with the product. That’s why we’ve created our behavior-based Customer Satisfaction Algorithm™ that gathers customer reviews, comments and Cascade reviews across a wide range of social media sites. The data is then presented in an easy to digest form showing how many people had positive and negative experience with Cascade. With that information at hand you should be equipped to make an informed buying decision that you won’t regret. What are Cascade pricing details? What integrations are available for Cascade? If you need more information about Cascade or you simply have a question let us know what you need and we’ll forward your request directly to the vendor.